Baku 2015 European Games is today proud to announce that the State Oil Company of the Republic of Azerbaijan (SOCAR) has signed an agreement to become an Official Partner. The deal will see Baku 2015 European Games branding on every SOCAR forecourt and outlet across the entire country to raise awareness of the event. The deal was announced today at a groundbreaking ceremony in the presence of Azerbaijan’s President Ilham ALIYEV and First Lady Mehriban ALIYEVA to mark the beginning of the construction of the South Gas Corridor extension. Significantly, today also marks the 20th anniversary of signing of the ‘Contract of the Century’ which saw the historic agreement to open up the natural resources of Azerbaijan with the international community. 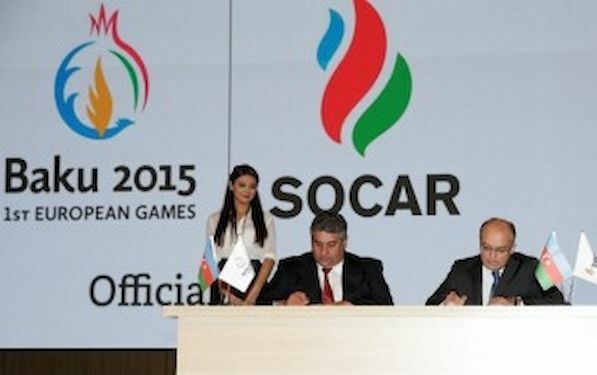 SOCAR become the fifth Official Partner of Baku 2015, joining P&G, Tissot, BP and Nar Mobile. SOCAR – who employ more than 60,000 people – have a long standing association with major sporting bodies and events, including the Association of Football Federations of Azerbaijan. They have also agreed to be one of the main sponsors of the France 2016 UEFA European Football Championship.